“Yeah, sons of thunder!” was reportedly how Led Zeppelin singer Robert Plant greeted the return of the group’s signature roar during their first tentative reunion rehearsals last summer. The quote, which drummer Jason Bonham recounted to Rolling Stone magazine shortly before Zeppelin reunited onstage last month, captures Plant’s peculiar sense of mythology, both about the band and also traces of the “Lord Of The Rings” obsession that he nursed throughout Zeppelin’s early years. The statement also gets to the group’s very concept of its music: Play like monsters unleashed. This sound — gargantuan guitar riffs, unbridled vocal wailing and a rhythm that groans and sprints forth like a division of Panzers — matched their daily existence of playing enormous arena stages, crisscrossing countries like roving hordes and bludgeoning the eardrums of legions of fans. While Plant was obviously pleased that these former rock gods could still hammer like they used to, enough time has passed for their musical progeny to be ones doing the bludgeoning. Bands like Wolfmother or, more embarrassingly, the Darkness, prove there’s no shortage of young charges willing to pick up where their forefathers left off. 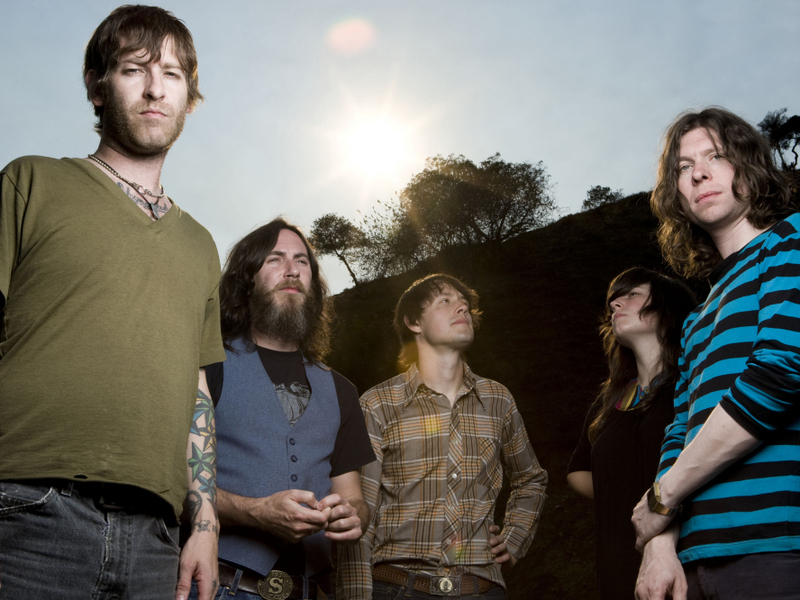 One of these modern-day “sons,” Black Mountain, has positioned itself as the true heir to the ’70s heavy-rock legacy. The five-piece’s new album, “In The Future,” is a wakeup call to any who think no-holds-barred rawk is a relic of the past. To start, the past is certainly uppermost on the Vancouver, British Columbia-based band’s mind. “In The Future” is rife with sonic allusions to Zeppelin, Black Sabbath, Pink Floyd and others. But unlike other pretenders who just replicate what’s been done, the new album cements the hopes for Black Mountain that many have long dreamt of since the ensemble’s first record. Even though their music shares a common denominator with the classic-rock dinosaurs — the skull-crushing riffs — the quintet effectively lays claim to the mantle by what they play between the maelstrom of guitars. Black Mountain’s 2005 self-titled debut was also heralded as an ode to Jimmy Page and Tony Iommi, but a more careful listen would reveal subtler musical dynamics that highlight non-Beavis and Butthead-approved influences, such as jump blues, prog-rock, folk, psychedelia and dance music. “In The Future” expands on this and yet is a more cohesive album. Song after song, the guitars pay dutiful tribute to their idols, but there are also whiffs of eclecticism, like on Zeppelin and Sabbath’s records, that are often overshadowed by the fearsome melodies. This is the most important lesson that Black Mountain seems to have learned and like any good pupil, recited on the new disc. “Tyrants,” too, begins like a headbanger’s dream. The galloping “Immigrants Song” rhythm is the theme music accompanying scourging packs of barbarians riding across the countryside, but this eventually slows and morphs into an eight-minute, hard-rock operetta. A series of interludes emerge and then blend into each other. Jeremy Schmidt’s wavering, sci-fi keyboard envelops and guides the transition from hard-rock heaven into a quiet episode reminiscent of Minnesota slowcore pioneers Low. All listeners hear is the thud of a bass drum and the male-female vocal harmonizing by Webber and band frontman/guitarist Stephen McBean. This creeping melody eventually gives way to more heavy-metal thunder featuring Metallica-like guitar licks and palpitating drumwork. Just as smoothly as it first disappeared, the stillness of old returns, boosted by a keyboard-derived flute and acoustic guitars that accompany McBean and Webber’s earnest crooning. The next track, “Wucan,” is less complicated but just as brilliantly meandering. The track is a steady, relaxed excursion shepherded along by an elevating guitar motif. McBean and Webber trade despondent vocal lines, but it quickly becomes clear this track is really just a showcase for keyboardist Schmidt. He is the group’s great instrumentalist and one of their key assets. He combines all the hyper dexterity of the Band’s Garth Hudson with the erudite taste of Pink Floyd’s Rick Wright. His influences explicitly recall the luminaries of progressive rock and he utilizes this background on “Wucan” to construct a whimpering synthesizer solo that wonderfully suggests both Pink Floyd’s “Shine On You Crazy Diamond” and Queen’s “Flash Gordon” soundtrack era. It’s Webber’s turn in the spotlight on tracks like “Night Walks” and “Queens Will Play.” Her breathy, frail voice is unexpectedly versatile, running the gamut from vulnerable to searing. Her reverb-tweaked singing on “Queens Will Play” suggests a woman who’s overtaken by passion. “Demons may be hiding in our shadows,” she hisses, as if giving a warning with eerie paranoia. “Night Walks,” however, she is much more collected, calmly warbling above a layer of haze from a church-organ-like synthesizer. Again shadows preoccupy her mind, but she is more meditative about them than fearful. Like the best moments of Low’s music, the sparseness of the track’s production recalls a hymn. But, for those who just want to hear a guitar gale, “In The Future” has plenty of visceral moments. The 16-minute “Bright Lights” is the record’s moody epic. Obsessing on a dystopia vision of the future, McBean and Webber alternately lead the ensemble through before yelling their guts out to concussive guitar chords and carpet-bombing rhythms. Briefer but every bit as brutal, “Evil Ways” is a zany brawl of ululating guitar passes, Hammond organ digressions and McBean’s distorted vocals doing their best imitation of Greg Lake from Emerson Lake and Palmer. The King Crimson-esque guitars lay back for much of the song until the chorus, when they demonstrate their full might with full blasts of amp-power. Best of all, the cut features a terrifying wah-wah solo that resembles those tracked by a young Dave Navarro of Jane’s Addiction before he became more obsessed with Hollywood than shredding. Before it’s over, McBean rips out a couple more stabbing riffs like he’s Zeus hoping a few final lightning bolts will conclusively bring an end to it. Black Mountain’s preoccupation with thunderous music might leave them open to those who charged them (and others) with releasing albums in which, in essence, the song remains the same. But those are too focused on the familiar hard-rock form and ignoring what the band is doing with it. “In The Future” is testament that these sons of thunder are ready to conquer. If Zeppelin or a reunited Black Sabbath is unwilling to fill an arena stage, here’s a band that’s capable and hungry to do it. Tags: "In The Future", Black Mountain, review. Bookmark the permalink.